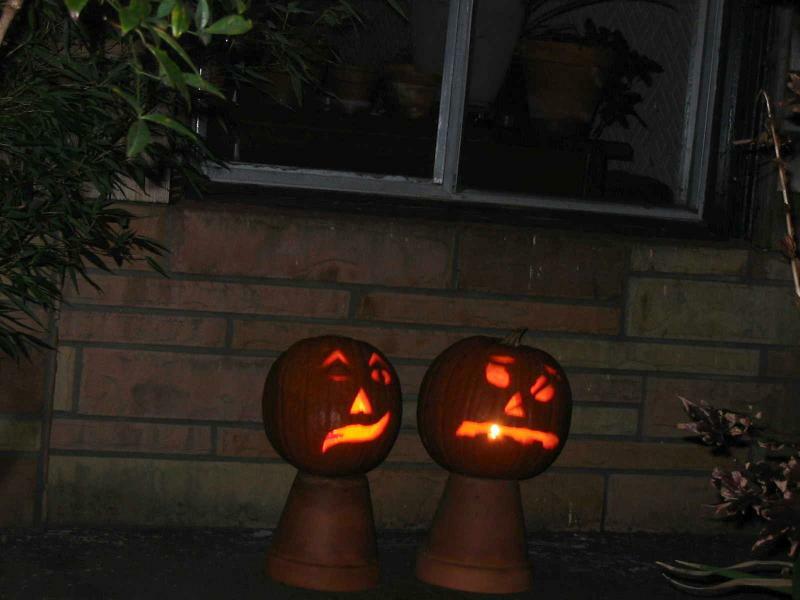 We carved ourselves some jack o' lanterns. Check 'em out. I got to ride on one of Muni's historic streetcars today. This one was an 1940s San Francisco model. Blue and gold exterior, green and cream interior, green vinyl seats. Old fashioned metal-and-glass slide-up-and-down windows that remind me of school busses. These ride up and down Market Street and to Fisherman's Wharf, but they go on the J-Church route to get there from the garage at Balboa Park, and they take passengers, because why not? But for some reason they made us all get off the car at Castro Street and get on another one — the exact same model, but with a green and cream exterior, marked Illinois Terminal. It turns out that there was a single streetcar design, the 1934 PCC model, which was used by thirty-three different cities at the height of its popularity. This is the sort of tidbit that tells you streetcars used to be a serious thing in this country. Muni's modern cars are custom made for them and you can bet they're more expensive. Even after adjusting for inflation and mod cons. Time was, chopping up onions didn't bother me at all. These days, it seems like I can barely get started before I have to go flush out my eyes. I always thought this was just me getting more sensitive to the key chemical (propanethial S-oxide) as I got older. But just now I went to chop up a leftover onion half that had been stored in the fridge ... no problem at all. Thinking back on it, I used to keep onions in the fridge, because I didn't have anywhere else to keep them (this was in college, where I was sharing a tiny kitchen with four to six other people). Maybe they don't exude so many fumes when they're cold. On a completely different note, consider the following political proposition: Everyone should be allowed to move to a different country, if they want, no questions asked. Once there, they should automatically get all the duties and privileges of citizenship of that country. Pay taxes there, vote there, everything. In other words, migrating between countries should work the same way migrating between subregions within a single country does now. I'm certain this is a radical position. What I'm wondering is, does it have a name, and are there now, or have there ever been, political groups that advocated it? If so, what were their other positions? Shout-out to Elusis for this LJ article ranting about Marriage Protection Week, which really ought to be an op-ed column in a widely read national newspaper. Went down Mission Avenue looking for that chest again. Still haven't found it, but I did find a little hole-in-the-wall Guatemalan restaurant that serves absolutely delicious chile rellenos. And the staff address you in Spanish even if you're a gringo. I hope I didn't make too much of a fool of myself. They had copies of a Guatemalan newspaper, Prensa Libre, on every table. I like reading foreign newspapers. For instance, they'd never report in an American newspaper that construction of a new building for Guatemalan government ministries has been paralyzed by cost overruns and finger-pointing between the government and the construction firm ... ground broken in 2001, supposed to be finished eighteen months later, work suspended in mid-2002 and no progress since. That wasn't the big news, though, the big news was the national elections; interestingly, the results in the race for mayor of Guatemala City got more play than the competition for seats in the National Assembly. Don't know what to make of that. I'm mopping down the kitchen floor and, as usual, the mop doesn't work very well. I've never had a mop that worked to my satisfaction. The big string mops with separate wringer-bucket work better than the small sponge mops with wringers built into the handle somehow, but still not well. Either way, you're using the same surface to lay down soapy water as you are to wipe the water and dirt back up. Also, you only have the one bucket, and the water in the bucket gets dirtier as you go along. If there's a lot of floor surface, by the end of it you're liable to be taking dirt out of the bucket and putting it back on the floor, especially if there's hair involved. And finally, no matter how good your mop is, it cannot get the floor completely dry, nor will it reliably pick up all gross-sized dirt particles. To get them, you have to dry-sweep the floor first, doubling the amount of work. How might mop technology be improved? I envision a device which is not unlike a carpet steamer. It has clean and dirty water tanks, and a cleaning head with three stages. First you have a dry vacuum; this gets the gross-sized dirt particles that aren't stuck to the floor. Then you have a rotating scrub brush, through which clean soapy water is slowly pumped. Finally, there is a wet vacuum with a rubber squeegee to make sure all the water gets picked up. The water needn't be heated and you don't need nearly as much as a carpet steamer needs, which should mean that the device can be smaller and less awkward than a carpet steamer. It might even be possible to use it as a regular vacuum cleaner (just disable the water supply pump). One of the classic streetcars Muni runs on their F-Market line, out of service, with a destination sign reading: NOWHERE IN PARTICULAR. Alas, a storage chest has still not been found. The "build it myself" plan is looking better and better. But I spent the entire day out-of-doors! Yay! And there are some amazingly bizarre things for sale in stores on Valencia Avenue. The pirate store is not to be missed. There's another place that should call themselves Mad Scientist's Lab Prop Supply. They don't, but they should. I worked fifty-seven hours this week. Ugh. This does include commute time to a couple of on-site meetings in Alameda, which were simultaneously quite interesting and quite dull. One can only sit through so many slides of exegesis of government standards before the mind begins to wander. Today I'm going to go walk up Valencia looking for a storage chest. I'm sitting in Cafe XO eating lunch and watching people go by. There seem to be a lot of women not much older than me (guessing) with babies or small children. No accompanying men; are they all glued to the baseball game? Or are these single mothers? Lesbians? All are possible, this being San Francisco. The Muni J-Church line runs down this street. Muni's modern streetcars have air suspension, you can see these big disk-shaped rubber air bladders between the wheel clusters (there's an official word for these things but I can't remember it, argh) and the undercarriage. Every time I see one go by I have this worry that they're going to blow out. How can a rubber bladder possibly support that much weight? This is silly, of course. I don't have the same reaction to the tires on trucks, and that's exactly the same thing. Perhaps the difference is orientation. We tend to think objects are stronger against compression forces if they're fatter. A tire on a truck looks fatter in the direction of the load, because it's oriented that way. The suspension bladders are lying on their flat sides and look awfully thin. I spent a somewhat frustrating afternoon trying to find just the right kind of chest-of-drawers for all the miscellaneous junk that's still in piles on my bedroom floor. What I want is unfortunately rather specific: a long, low chest with a lot of small (but not too small) drawers. My parents have had one of these for years. The closest I could find was a store that would have one custom made for me for $600 ... but only if I ordered it before Monday; they were having a 50% off sale on custom furniture. I'm pretty sure I could build this thing myself for about $100, so I'm not wanting to spend six times that much for someone else to do it for me. But I managed to get in a trip to Peet's and stock up on loose tea, so the afternoon was not a total waste. The instructions on the side of the bottle of stripper read "Apply a thick coat." This is not merely an attempt to get you to consume more of their product. Stripping paint produces large volumes of sticky goo. It is wise to have a disposable container handy to put the goo in. Plastic scrapers don't work very well, which is a shame, because metal scrapers will scratch hell out of the wood, which has been softened by the stripper. Kneepads are a wonderful invention. Too bad I don't own any. Disposable nitrile gloves are also a wonderful invention. These I do have. Stripping paint from flat objects is merely tedious. Stripping paint from cylindrical objects is almost impossible. You're not going to get all the paint off, no matter how hard you try. It will be a damn shame if this table turns out to be intrinsically hideous, not just covered in ugly blue paint.